At Comfort Solutions we know our stuff and pride ourselves on our quality, workmanship and customer service. Whether you have a new build or an existing home, we can work with you to plan and create a tailored solution to meet your needs. Working right through from design to installation, as well as on-going maintenance, we can ensure your system is the most efficient solution for your space. To use an old cliché, no job is too big or too small for our team – we’re confident in all areas of air conditioning and ventilation and are ready to take on any job no matter the size or scope. 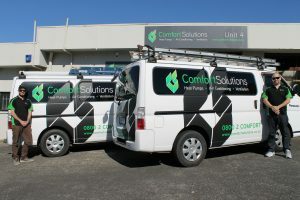 Comfort Solutions is an Auckland based company founded by Adam Slater and Dan Mason, who have a combined experience of over 30 years in the industry. Both Adam and Dan hold HAZTEC Fillers licences, are Site Safe certified and are accredited installers of Panasonic, Fujitsu and Mitsubishi Electric heat pumps. Dan (right): When he’s not hard at work Dan is an avid sports fan, with a passion for Rugby, League and Boxing in particular. A keen traveller, in his downtime Dan can often be found with his feet up at the beach or enjoying a drink or two at a restaurant or winery. Adam (left): Adam has also been bitten by the travel bug, and when he’s not warming Auckland homes he can be found chasing endless winters to feed his passion for Snowboarding. In the summer you’ll find manning the BBQ or parked with a fishing pole.